Let's take a look at the Ethereum Ecosystem and learn about open source enterprise integration. Ethereum has an order of magnitude and more active developers than any other blockchain platform and as dictated by the Metcalfe's law, this gap widens day by day. Ethereum coding school CryptoZombies has over 200K users, and Truffle development framework has over half a million downloads. The Ethereum technology has the interest of enterprise software companies. Customized Ethereum-based applications are being developed and experimented by financial institutions such as JPMorgan Chase, Deloitte, R3, Innovate UK, Barclays, UBS, Credit Suisse, and many others. One of the best known in this area is the J. P. Morgan Chase developed permissioned of Ethereum blockchain called Quorum. In 2017, Enterprise Ethereum Alliance (EEA) was setup up by various blockchain start-ups, Fortune 500 companies, research groups, and others with the aim to help the adoption of Ethereum-based technology. It provides standards and resources for businesses to learn about Ethereum and leverage this groundbreaking technology to address specific industry use cases. Ethereum has passed the moment when it was a hipster technology or a scientific experiment, and now, it is a fundamental, open-source, decentralization technology that enterprise companies are looking into. Talking about open source and the enterprise, I thought I would also do my tiny piece of contribution to the Ethereum ecosystem and help with its adoption. Implementations of the widely used Enterprise Integration Patterns (EIPs). (Notice this are not Ethereum Improvement Proposal that shares the same acronym.) EIPs provide a common notation, language, and definition of the concepts in the enterprise integration space (think of publish-subscribe, dead letter channel, content-based router, filter, splitter, aggregator, throttler, retry, circuit breaker, etc.). Some of these patterns have been around for over a decade and some are new, but they are well known by anyone doing messaging and distributed system integration for a living. Companies are more integrated than ever, and the systems within the companies are more integrated than ever. And if you are a Java shop, most likely there is already some Apache Camel based integration in use somewhere in the organization. Now you can use Camel and all the capabilities it provides also to talk to Ethereum. 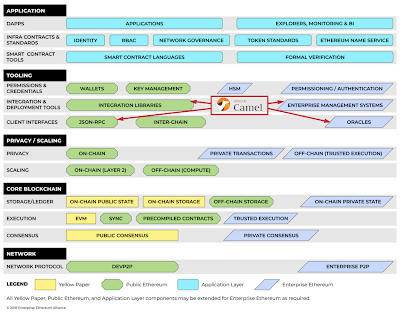 Bellow is the Enterprise Ethereum Architecture Stack (EEAS), which represents a conceptual framework of the common layers and components of an Enterprise Ethereum (EE) application according to the client specification v1.0.